Amy's Creative Pursuits: My Early June Garden: The Peonies Are In Bloom! This is the perennial version of the Bachelor's Buttons you see in the garden stores this time of year. This one comes back year after year, and even reseeds making new plants! The bees love it too! 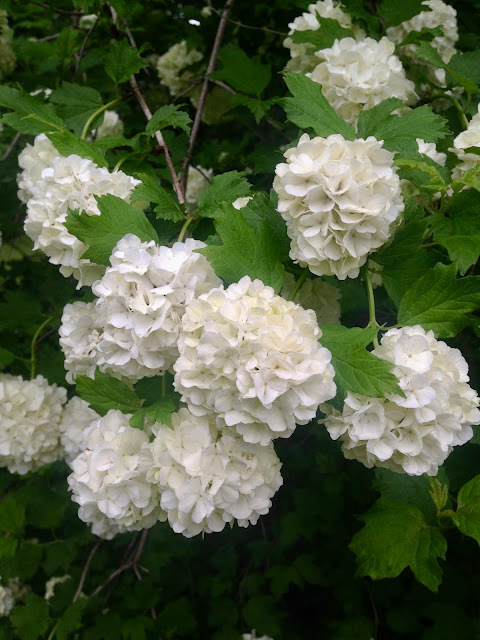 I showed you my Snowball Bush (Viburnum) in my last garden post two weeks ago, but it was just starting to open up. Now it's in full bloom! Aren't the blooms just gorgeous? I love this bush! I have two of them in my yard. I can't recommend them enough if you are looking for a new bush for your yard. Just give them a lot of space; they grow big! The Flowering Onion or Allium is still in bloom. The leaves are just starting to yellow and fade. 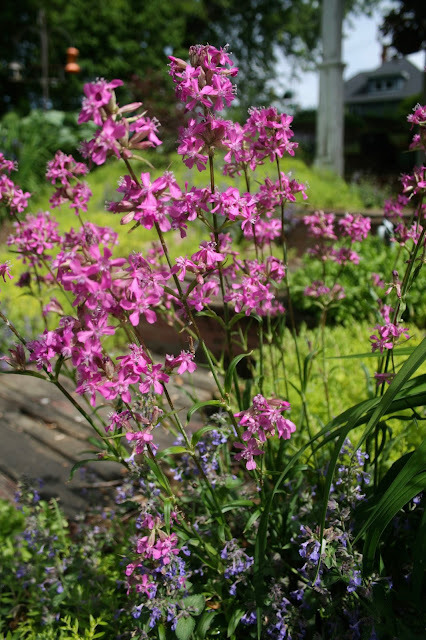 Did you know this plant just disappears when it's done blooming? I will plant some annuals in it's spot or put some pots here when the leaves fade away. 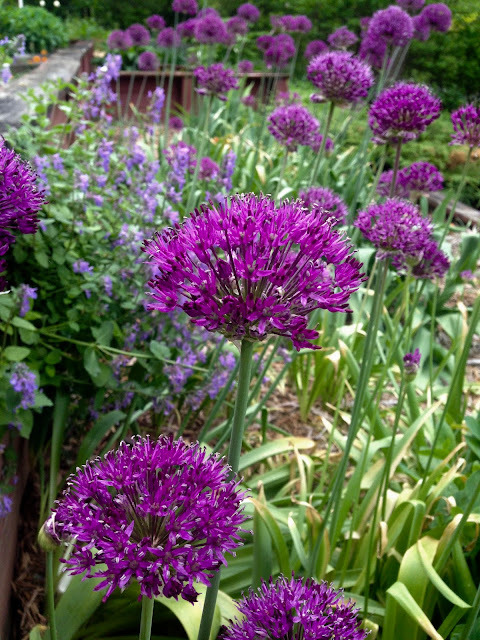 If you have a problem with deer or rodents digging up your bulbs, then you'll want to plant some of these. Animals won't touch them because they are from the onion family! You can also dig up and divide them to create more plants. 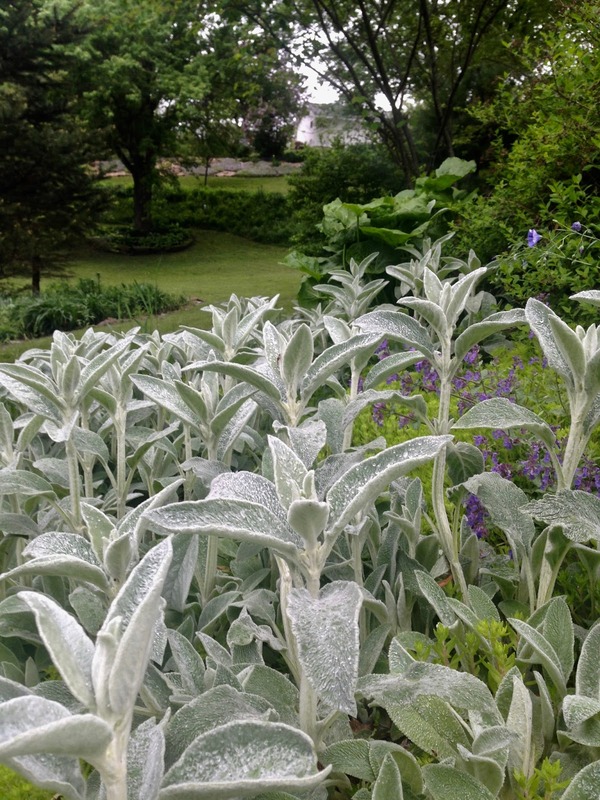 My Lamb's Ear is looking great! It's starting to get ready to flower. Soon I'll be seeing tall purple spikes! I dug up and divided a lot of my iris last year so I was worried I would not see much this year, but they surprised me and I have some nice blooms. 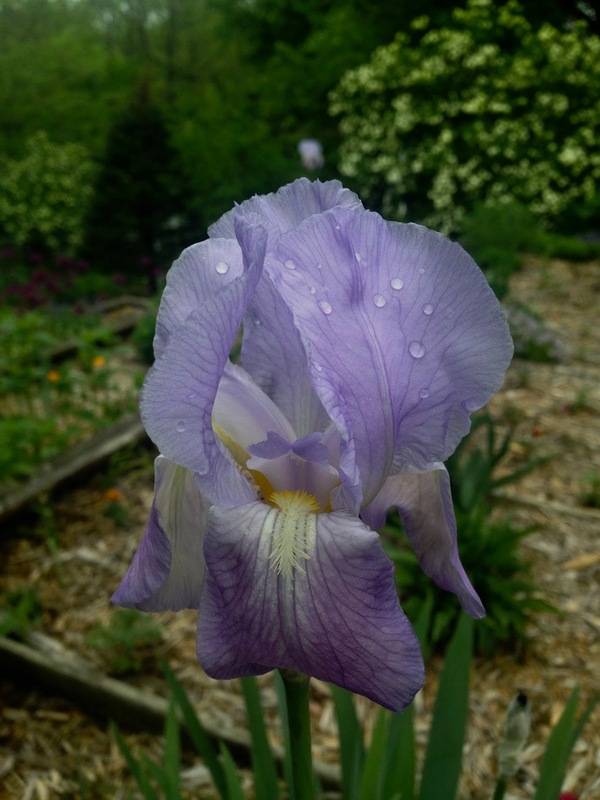 I have many different varieties: this is a lavender bearded iris. 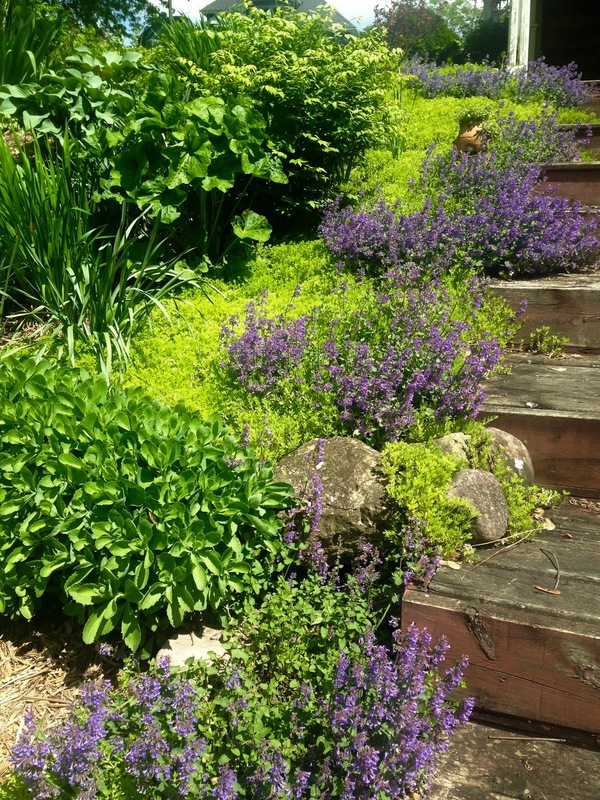 I planted Cat Mint and a chartreuse ground cover going down my garden steps. I love the way the two color combos look together, and they work great for edging along the steps. This contraption was on my property when we bought it twenty years ago. I've never really liked it, but I made the best of it by hanging some inexpensive flower baskets from it. This is my favorite bearded iris that I have. 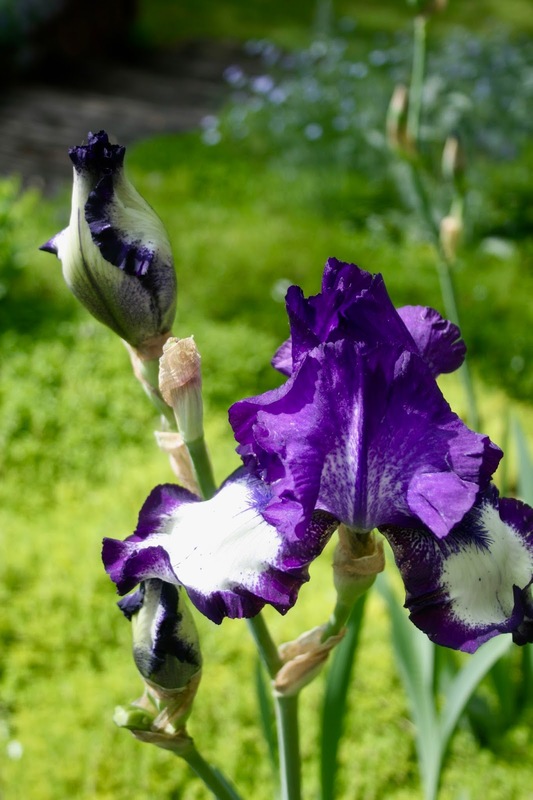 It's a beautiful blue color (which is rare in Iris's, most are purples) and it's has gorgeous, large, ruffled blooms. The only herb I grew this year is Chive. 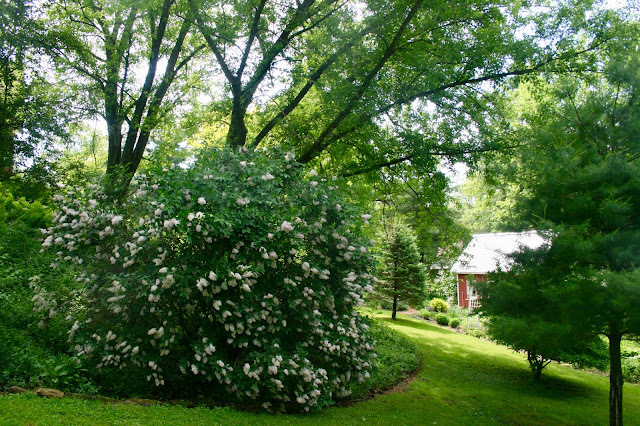 I love the blooms, and even when it's not in bloom, it's green stems are pretty. 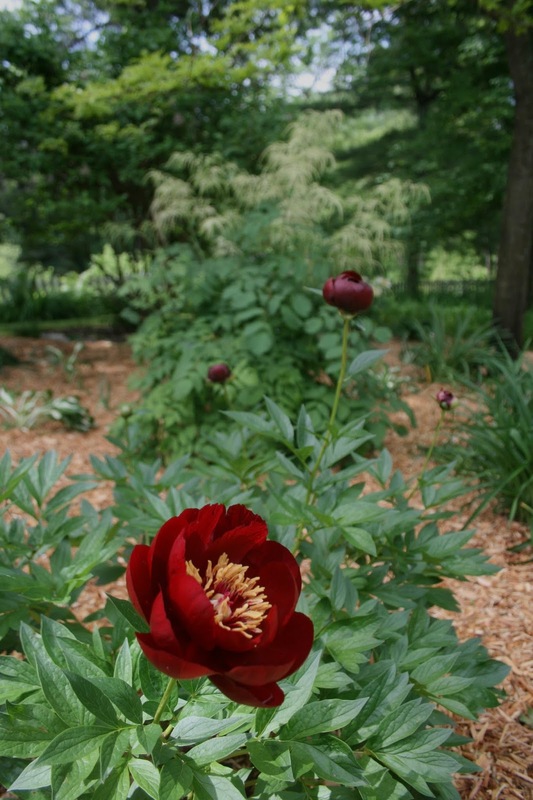 I absolutely love this peony! It's a gorgeous hot pink with a yellow center. Poppies are one of my favorite flowers. 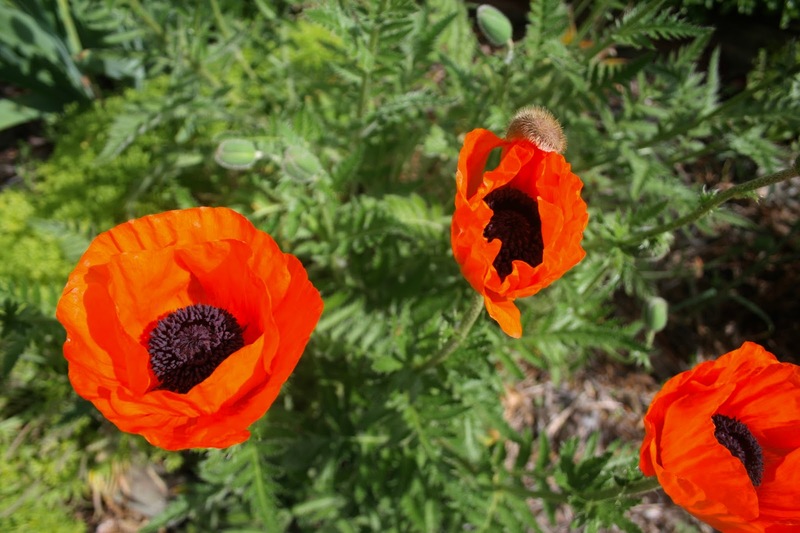 I love their bright orange papery blooms! The orange poppies look fabulous against the blue bearded iris and pink Marguerite daisies! 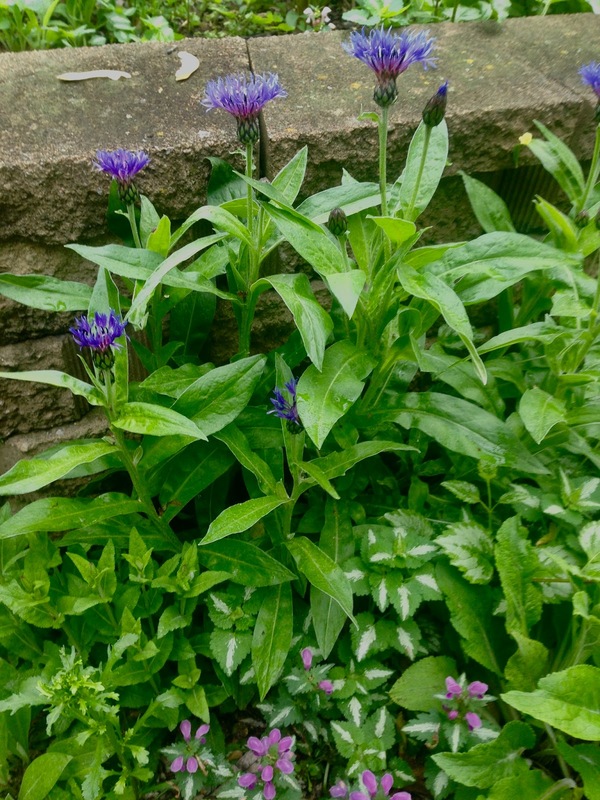 I have no idea what this perennial is, but I would love to get more of them! It has such pretty pink spring blooms. 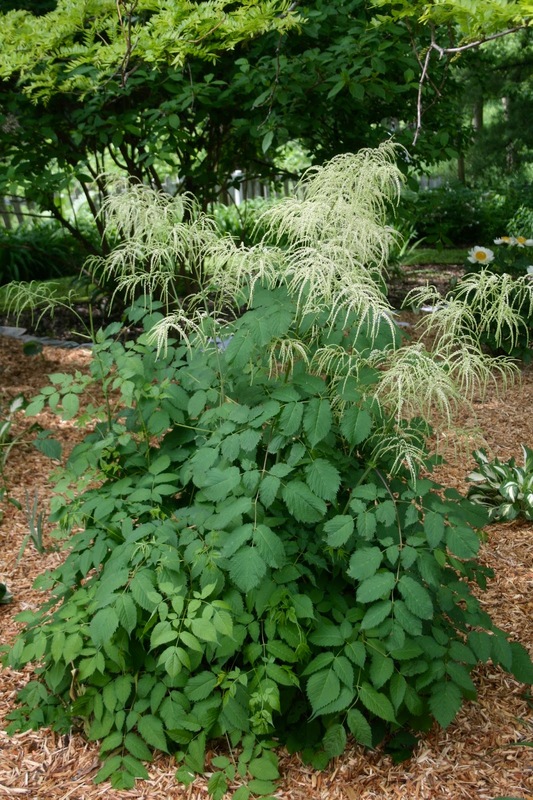 It never outgrows it's spot and is not invasive, so it's totally low maintenance. Anyone know what it is? 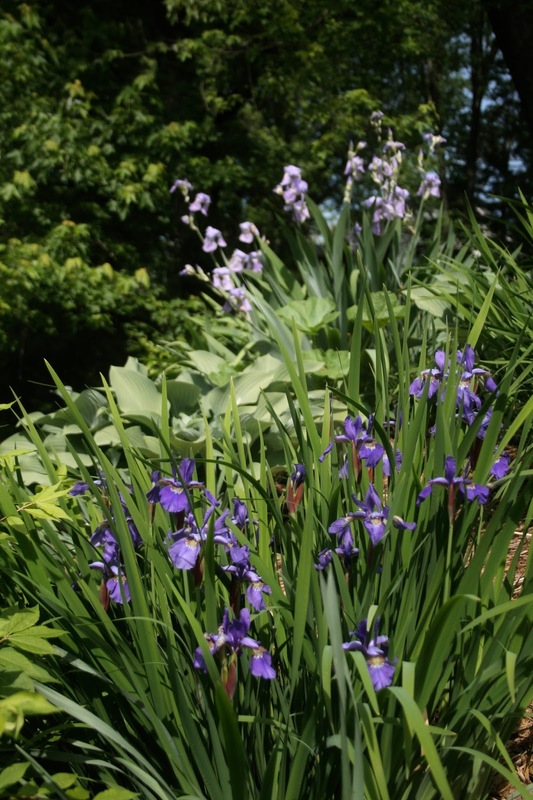 I have Siberian Iris growing everywhere in my yard because it reseeds itself. The flowers form these attractive pods that I like to leave on the plant for interest, but I might have to cut them down this year as I am tired of the reseeding. This is a very dark purple iris that was already on my property when I bought it. I just keep digging up and dividing them so I probably have more of this type of iris than any other kind. 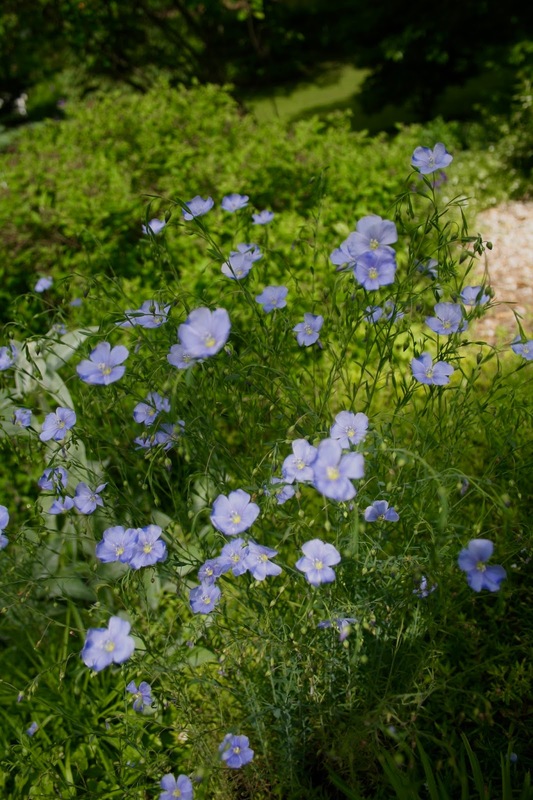 This is a lovely wildflower called Blue Flax. It blooms only in the morning. 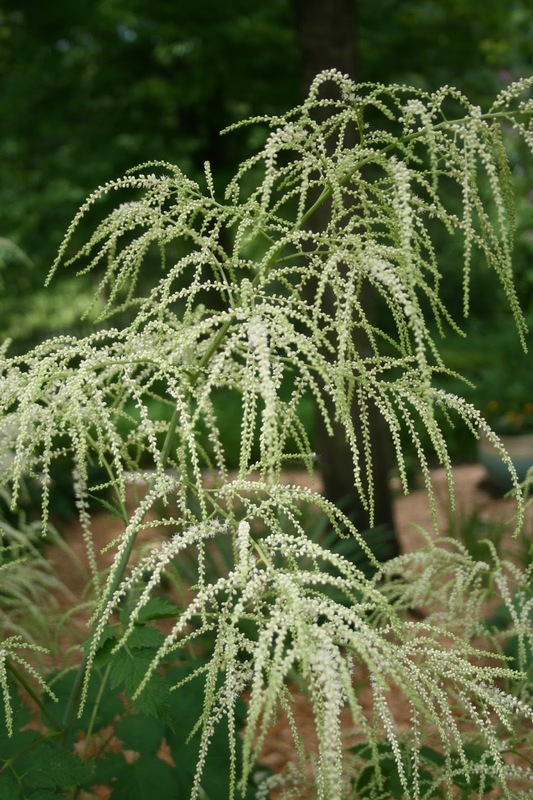 The booms are very dainty and sit atop wispy stems. It is so pretty. It reseeds itself so it can surprise you where it decides to grow, but it is not invasive. It likes a hot, dry spot. 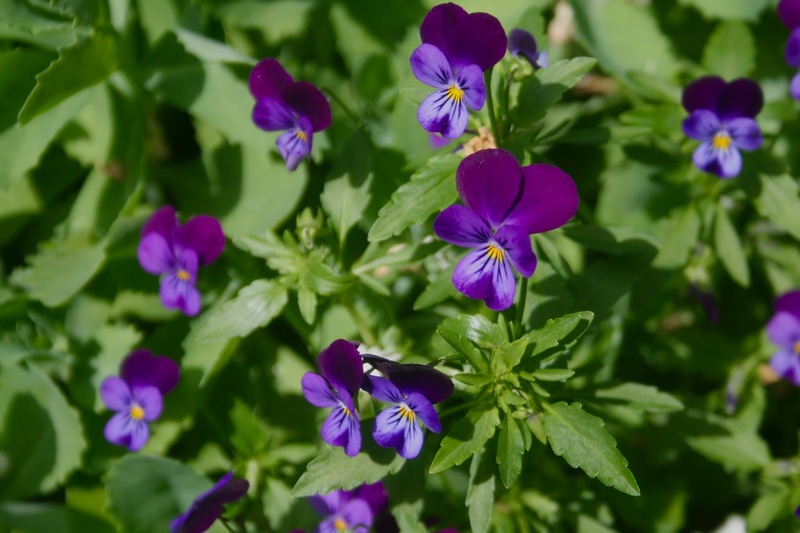 Another re-seeder or "Surprise Plant" that I like to call them is the wild pansy. I let these beauties grow wherever they want. They are not invasive, so why not? 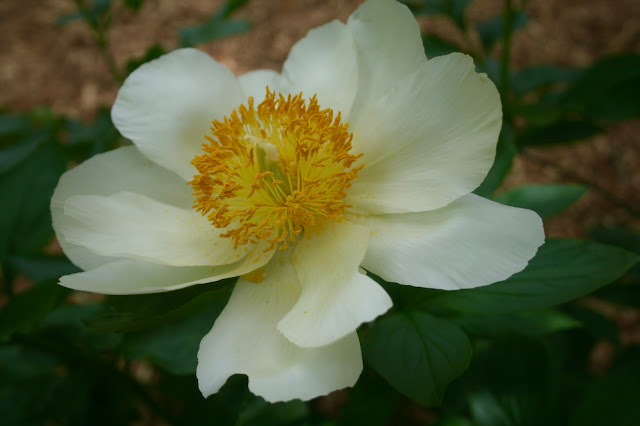 I have this lovely white peony growing in my yard. I'd say it's one of favorites, but all peonies are my favorites. 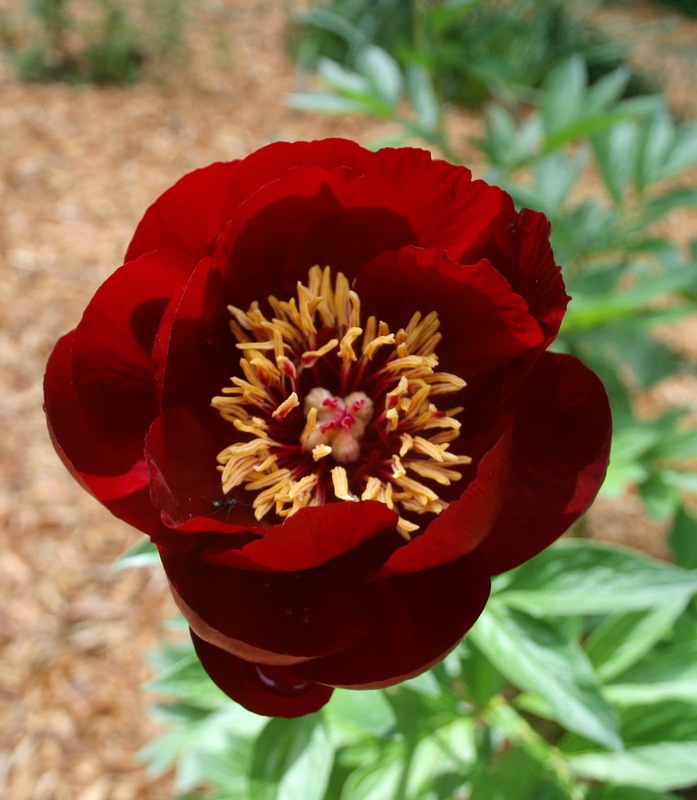 Here is a beautiful dark red peony. This is Goats Beard and is probably my all time favorite plant for the shade. It has very attractive foliage so it's pretty even when not in flower. It doesn't spread by seed or runners, and just grows in this large clump. It gets bigger and more magnificent every year. Here is a closeup of the Goats Beard flower. Isn't it unique? I still have plenty of lilacs in bloom. This variety is called Little Princess. 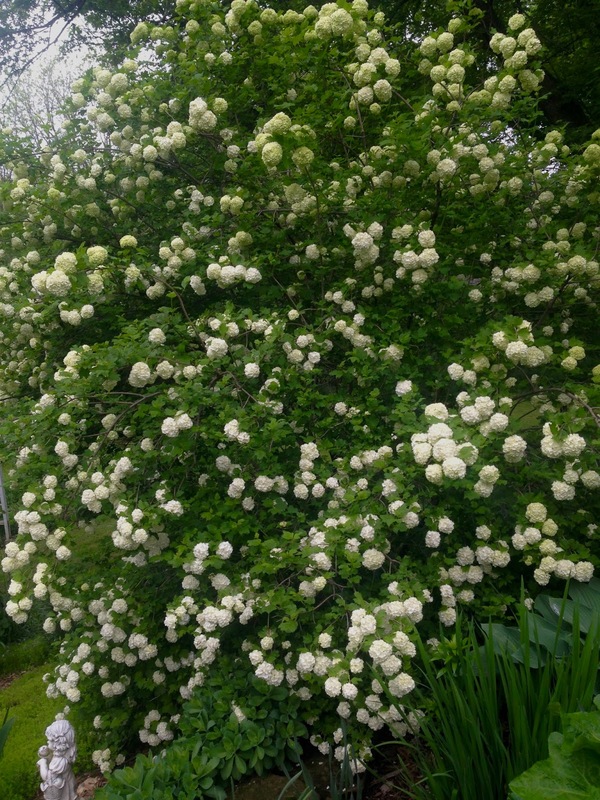 It's suppose to be a small lilac bush, but mine grew huge! 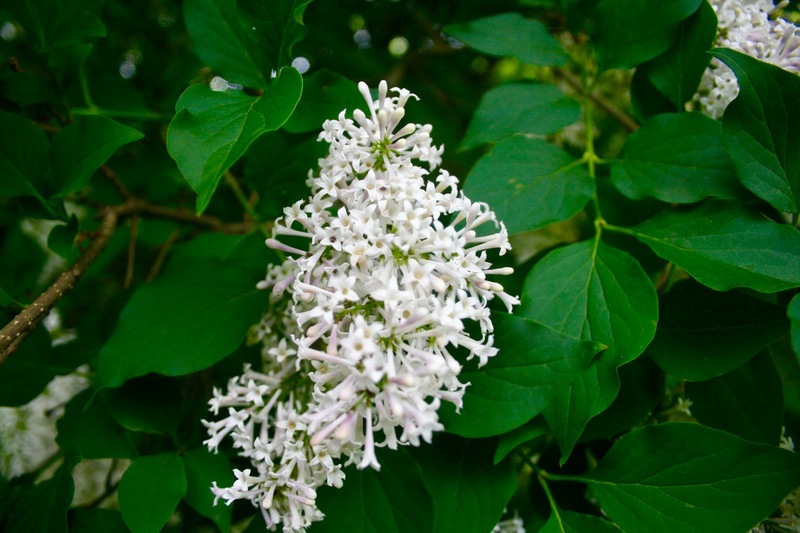 The blooms smell amazing on this lilac bush. You can smell it from the minute you step outside! 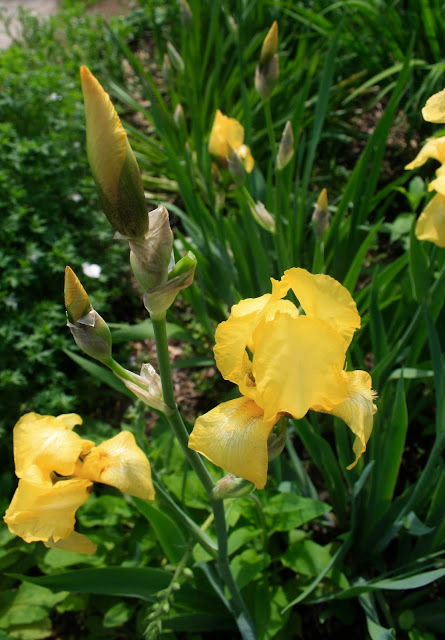 These yellow iris were brought over from my husband's grandmother house and planted in our yard. 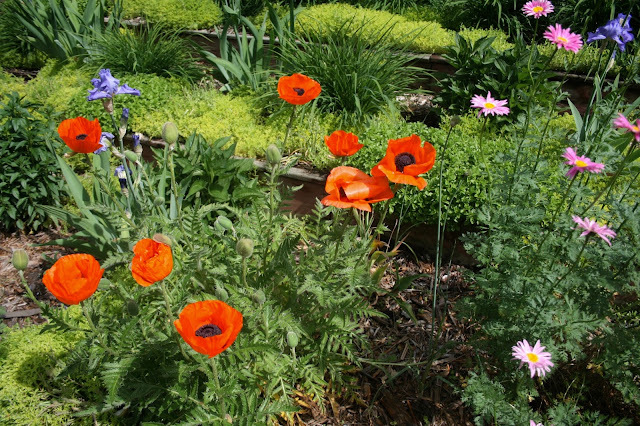 Isn't it neat that we can carry beloved plants from one generation to the next? 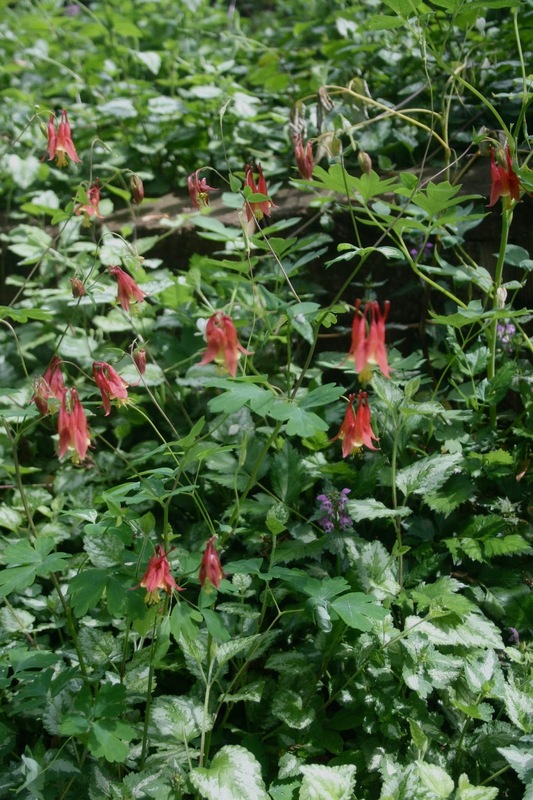 And finally, some wild columbine. I use to have a ton of this plant, but the ivy really choked it out. The garden this is planted in is over-run with ivy. I hope to redo this garden next year. 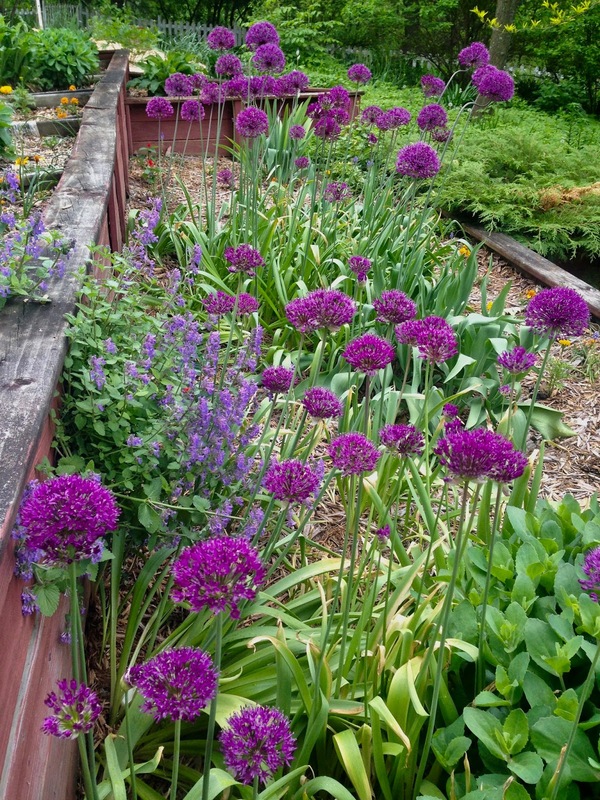 I just love your posts with your garden photos and comments. What a beautiful place you have created. Oh thanks so much! 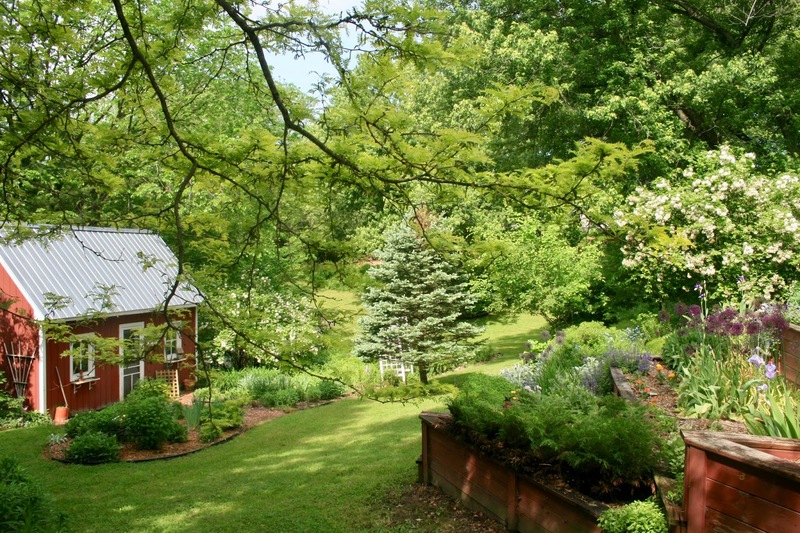 My yard use to be so much more beautiful, but it fell into disarray when I suffered a back injury and later went to work full time. Now that I'm home again, I've been slowly working at restoring it back to it's former glory. It'll be a few more years before I have it completed. 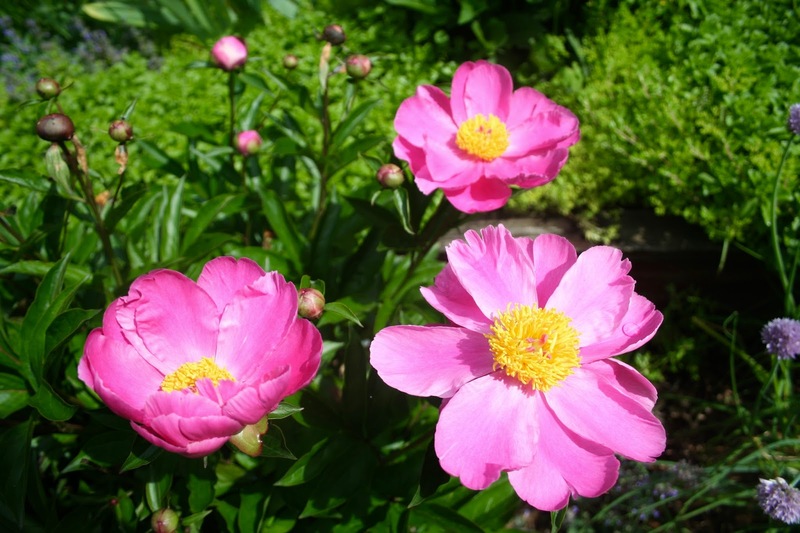 I grew up with the huge multi-layer petal variety peonies that are 5 inches across and have thick full heads. They smell so good! Oh, I love peonies. I have the peonies you've described as well but those aren't in full bloom yet. 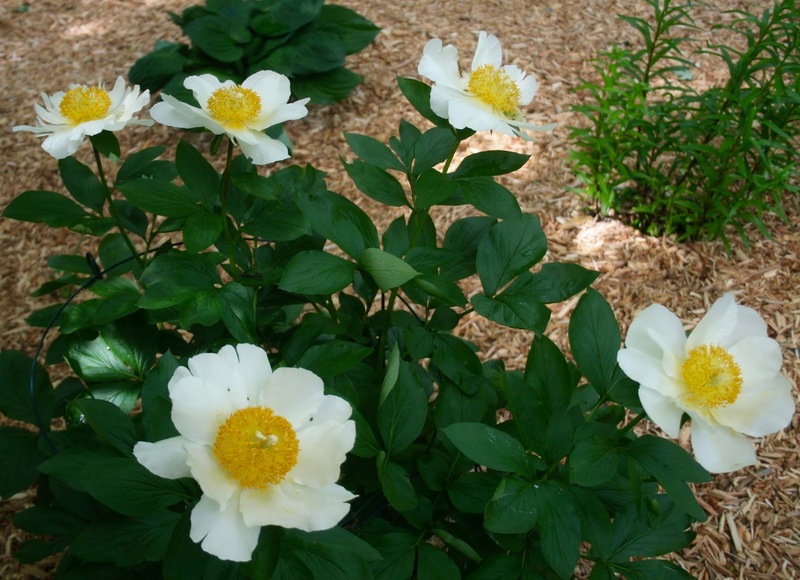 The peonies in today's post are early blooming varieties. I love your mix of beautiful flowers, you have so much in bloom! Loving those yellow Irises, such a vibrant color! I have light and dark purple ones but they are done blooming for this year. Do you have hummingbirds in your area? I can imagine they would love all the pretty flowers but not sure if they fly that far north. Thanks so much! 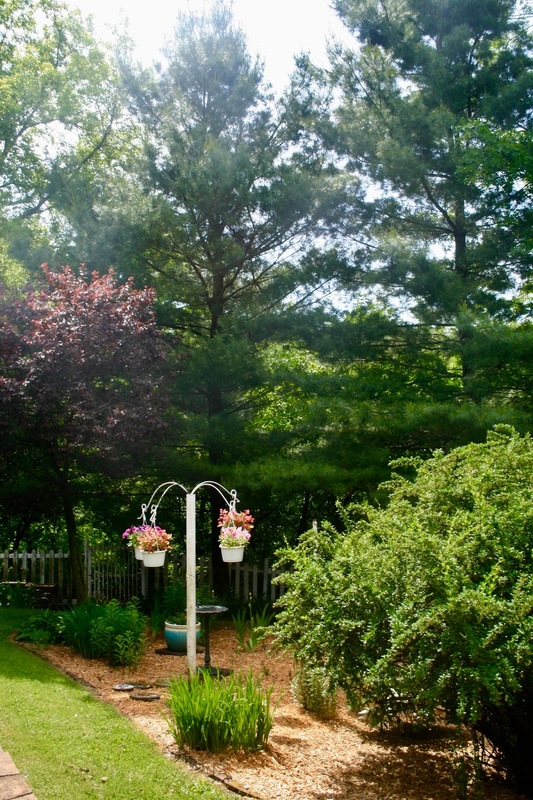 Yes, we do get hummingbirds in Wisconsin. They arrive in May and leave in October. I don't need to put a feeder out for them until late summer because they drink out of the Oriole feeder until the Orioles leave in late July and I take that feeder down. There are also so many flowers for the hummingbirds, they hardly drink from the feeder until late summer anyway. That's so nice that you get to see those pretty birds! I have one hummingbird feeder but they only come around once or twice during the summer. Such pretty creatures! I need to plant more flowers!!! Oh, that's such a shame. I see hummingbirds all day long. 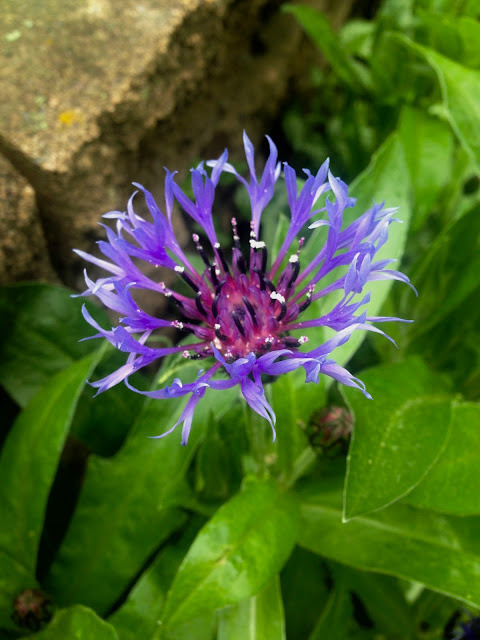 They love brightly colored, tubular flowers. 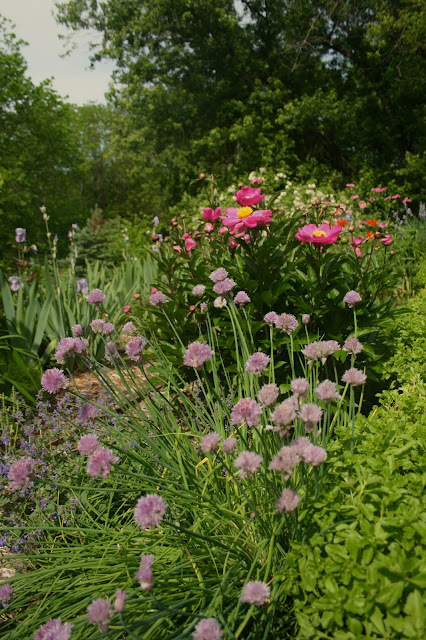 Their favorite perennials are bee balm or catmint. Oh,I live much further north and we get hummingbirds in our area. Central Ontario, on the same latitude as Ottawa. Those wee birds sure travel. It is amazing the flight patterns of birds. I'm always amazed at their precision. Orioles for example arrive on the EXACT same day in May every single year. How do they do that? Oh wow. You have so much blooming! I love it. So many beautiful flowers! They are all absolutely gorgeous! 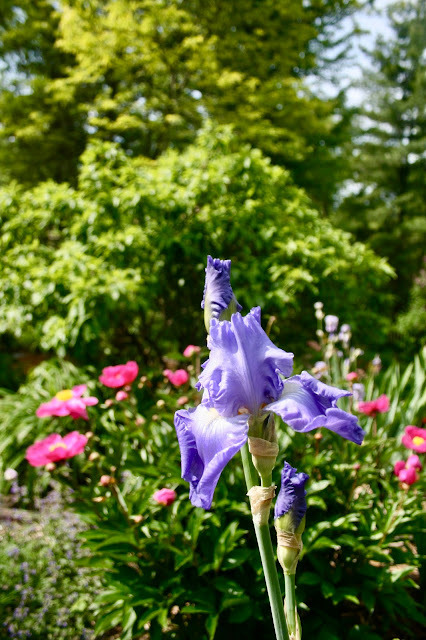 I love Iris and Peonies, so those are my favorite photos. What a beautiful garden you have. So many lovely flowers are blooming and wonderful photos !